2. I’m extremely grateful for my friends from work. 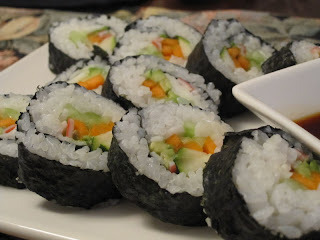 Three of us hung out on Tuesday and figured out how to make sushi together. It was so fun! Amy is quite the chef, so Diane and I are trying to learn all we can from her. We’re hoping to make it a little monthly foodie club. Yum! 3. Words cannot describe how thankful I am for my parents. They provide me with heaps of love and support. My dad sent me a really sweet email on Monday night, and it has encouraged me again and again throughout this week. 4. Dinner Club continues to be a lovely blessing in my life. I plan on posting more about it at some point, but basically a bunch of friends get together for dinner every Wednesday. It is a night that I look forward to every week, and I enjoy seeing how God uses simple fellowship to encourage our hearts. 5. We have a couple from the UK in our grace group, and they told us about St. David’s Day, which is celebrated on March 1st. 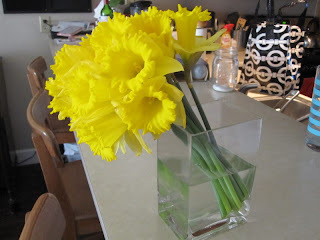 Apparently daffodils are the flower of the day, so I was inspired to buy some when I saw them at Trader Joe’s on Monday. They have now made me smile every time I’ve walked into the kitchen this week. Lord, thank you for daffodils.